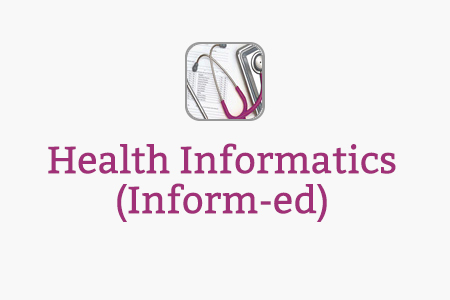 This course has been developed by the Department of Health to provide an introduction to health informatics for those moving into the field, although it may also be useful for those already working in health or informatics who wish to expand their knowledge, or for students considering entering a career in health informatics. The generally accepted definition of health informatics, and the one used in this course, is, ‘The knowledge, skills and tools that enable information to be collected, managed, used and shared to support the delivery of healthcare and to promote health and wellbeing’. Everyone working in health and care services uses information every day as a part of their job. 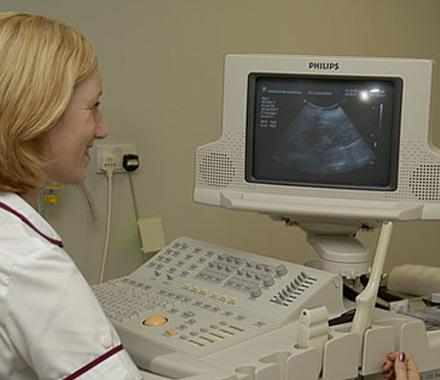 However there are also a growing number of people who specialise in information and ICT, providing essential support for clinicians, patients and managers, in areas such as ICT, information management, health records and clinical coding, education and training or the management of informatics functions. If you are moving into health informatics it can take a while to understand the structure and set up of health and care services, the language of health and care delivery, as well as some of the basic concepts behind clinical care. You will want to understand how the data and information you collect, produce, manage and communicate supports the modern NHS, and about the specific informatics needs and challenges in health and care. You will also want to understand the context in which new technologies and IT systems operate so that they are designed and implemented with the safety and quality of services to patients and the public at the fore. 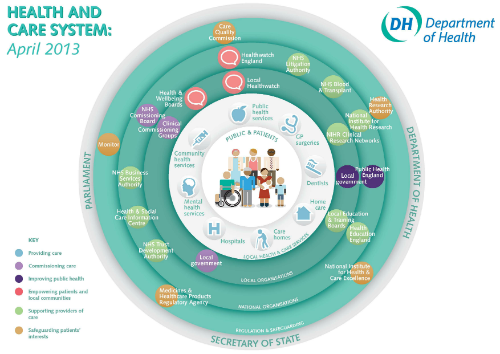 This diagram gives a developing overview of the health and care system from April 2013. A larger version can be downloaded as a PDF version below. Each of these modules should take around 20-30 minutes to complete and each one can be undertaken on its own or as part of the full course. The topic areas were derived from the competency standards set out for health informaticians by the UK Council for Health Informatics Professions (UKCHIP), and were tested in a survey of 70 health informatics managers both in the NHS and from other areas. Other topics, which could have been included, were found to already be available through other courses available to NHS staff, such as the Embedding Informatics in Clinical Education Programme (eICE). We actively encourage all feedback about the course, to help us improve and develop it. Please leave comments for each module in the feedback section within the e-LfH Hub. This session provides a general introduction to health informatics – what it is, what health informatics specialists do and how it contributes to the provision of high quality health and care services. This session will give an overview of health informatics and its role in the health service. 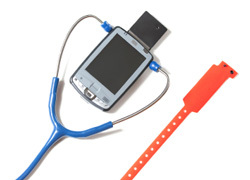 It is particularly aimed at those new to the health service and health informatics. If you already have an account with e-LfH, then you can enrol on to the Health Informatics programme by logging in to the e-LfH Hub, selecting My Account > Enrolment and selecting the programme. You can then access the programme immediately in the My e-Learning section. The Health Informatics programme is also available to NHS healthcare staff via the Electronic Staff Record (ESR). Accessing this e-Learning via ESR means that your completions will transfer with you throughout your NHS career.